The freeware vLSO (Virtual Landing Signal Officer) for FSX Acceleration Pack has been updated to version 0.6.3.7 Beta. AFS Design has released the Airbus A319, A320, A321, A330, A340, A350 and A380 package for FSX and FS2004. The recently released Alabeo Extra 300S aerobatic monoplane for FSX is now also available to purchase at SimMarket. - NEW Aerobatic smoke effect. - NEW professional flight dynamics developed by BERNT STOLLE. - NEW material shines and reflections. - NEW custom environment sounds. Sim Skunk Works has posted the features list from the soon to be released McDonnell Douglas AV-8B Harrier II for FSX. OpenVFR has reworked Italy, Sardina & Malta, Isla Madeira, Islas de Canarias, Isla Saint Pierre and Miquelon for FSX. The developer of the Outerra terrain engine has posted two new 3D Grass test videos in the Outerra Development Forum. LatinVFR is now offering up to 25% discounts on select products for FSX and FS2004. Sale ends May 31st 2012. FlightGear has has updated the world scenery database to version 19892. Details at the FlightGear Website. - Insane ground imagery at 2cm per pixel! - Absolutely the finest textures seen in FSX! 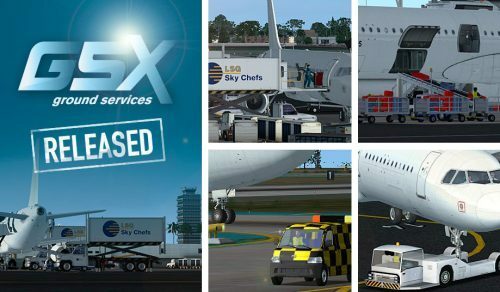 FSDreamTeam (FSDT) has released version 1.5 of Ground Services X for FSX. Available at the Product Page. Blue Sky Scenery has released the freeware Los Angeles - Part 3: Southwest photo scenery for FSX and FS2004. LimeSim has posted new preview screenshots from the upcoming Aerosoft US Cities X - Los Angeles scenery for FSX. Aerosoft has posted several new preview screenshots of the cockpit from the upcoming Airbus X Extended for FSX. Aerosoft has posted two 3DStudioMax model screenshots of the cockpit from the upcoming Airbus X Extended for FSX. 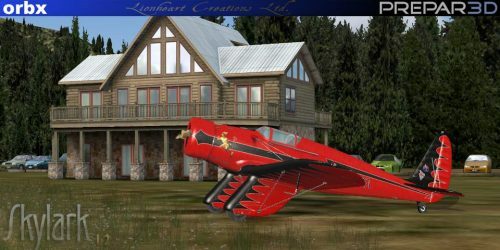 Aerosoft is offering a 50% discount on Rise of Flight - Iron Cross Edition. Offer valid through Monday May 14th 2012. FSBreak Episode 112: Computer Pilot Magazine, and getting started in FSX is now available at the FSBreak Website. Just Flight has announced development of the BAe Hawker Beechcraft 800XP and General Dynaics F-111 Aardvark for FSX. Newport Scenery has released the PhotoReal Key West scenery for FSX. Now available to purchase at SimMarket. 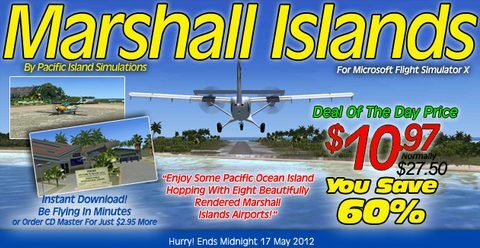 The Pacific Islands Simulation Marshall Islands scenery for FSX is on sale until May 17th 2012 at the PC Aviator Store. MilViz has added more preview pictures from the soon to be released Beechcraft B55 Baron for FSX. Lionheart Creations has updated the Pasped W-1 Skylark for FSX to version 1.2 with Prepad3D compatibility. - New more accurate flight model. - Updated visual models with improved afterburner and wing vapour effects. Dino Cattaneo has posted more previews from the Lockheed Martin F-35 Lightning II V2.0 project for FSX. Users in the aerofyFS forum have discovered config settings to change the daytime settings of the flight simulator. Flight1 has updated the Cessna C177B Cardinal II for FSX to version 1.1. Details and download at the Product Page. FlightSim Development Group has posted another preview render from Sharm el-Sheikh Intl. Airport 2012 (HESH). Carenado has posted more fresnel shader previews from the upcoming Cessna CT182T Skylane G1000 for FSX. AVSIM has opened the 2012 Demographic Survey to measure the various facets of community members. ASNews has published the first part of their exclusive interview with Espen Øijordsbakken from Coolsky. Aerosoft has posted more preview screenshots from the upcoming Amsterdam Schiphol (EHAM) scenery for X-Plane 10. Flightsim Commander has been updated to version 9.2. Details and download at the Aerosoft Website. NEW Flight plans can now be saved for the addon aircraft "Quality Wings"
JCS Aircraft has released the Northrop T-38 Talon Version 10 for X-Plane 10. Available at the X-Plane.org Store. FranceVFR has posted the first preview screenshots from the upcoming Aquitaine Photo HD Vol.1 scenery for FSX. FranceVFR has posted the first preview screenshots from the upcoming Alsace VFR photo scenery for FSX. Jacky Wan and Alton Yeung have announced the freeware Dragoneye Hong Kong photo scenery for FSX. Angle of Attack Secret Project Revealed - JetSet? 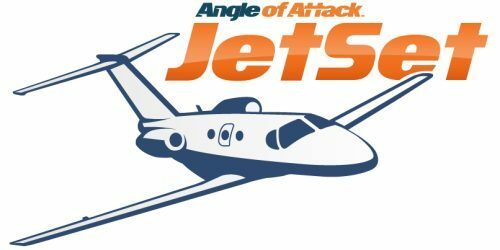 Chris Palmer from Angle of Attack has revealed JetSet. No further details or information is available at this time. Samdim has released version 3 of the freeware Antonov An-24/26/30 for FS2004. Available to download at AVSIMrus.